Published as "Damian Bacich. 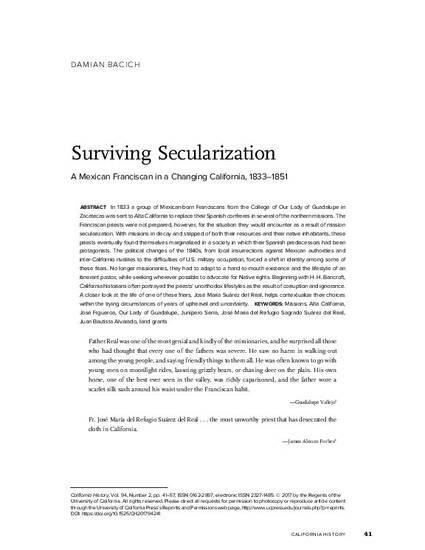 Surviving Secularization: A Mexican Franciscan in a Changing California, 1833–1851. CALIF HIST, Vol. 94 No. 2, Summer 2017; (pp. 41-57) DOI: 10.1525/ch.2017.94.2.41" © 2017 by the Regents of the University of California. Copying and permissions notice: Authorization to copy this content beyond fair use (as specified in Sections 107 and 108 of the U. S. Copyright Law) for internal or personal use, or the internal or personal use of specific clients, is granted by the Regents of the University of California for libraries and other users, provided that they are registered with and pay the specified fee via Rightslink® or directly with the Copyright Clearance Center.